I’ll use the vertex labels to also denote the corresponding angle measures. Take the sines of all 3 angles in the triangle: , , and . Would you believe it if I told you that these three sines satisfy the triangle inequality? Even more, would you believe it if I told you that a triangle with sides of length , , and is similar to the original triangle? Please think about this before reading further. Do you recognize the statement as implied by the law of sines? In fact, the law of sines even tells us that the similarity ratio is equal to the diameter of the circle circumscribed about the original triangle. We can use this understanding to prove the law of sines. 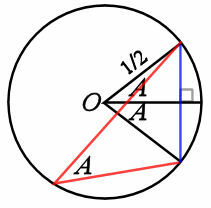 First, note that in a circle of diameter 1, an inscribed angle measuring degrees subtends a chord of length (see figure at left). 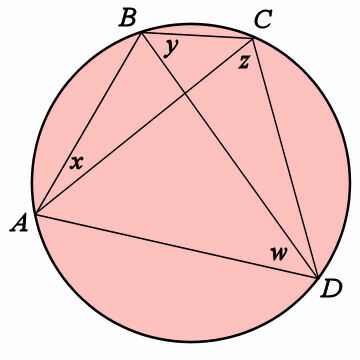 To see this, note that the blue chord has length because the central angle of the arc subtended by the inscribed angle with measure degrees has measure degrees. That means that if we scale a triangle so that its circumscribed circle has unit diameter, the lengths of the 3 sides of the scaled triangle must be the sines of its 3 angles, and since we know what the corresponding sides are, we get the law of sines, complete with similarity ratio being the diameter of the circumscribed circle. Just for kicks, we can use the law of sines to give the following proof of the law of cosines. 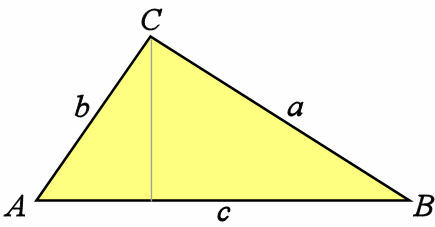 Ptolemy’s theorem relates the lengths of the sides of a cyclic quadrilateral and the lengths of its diagonals. The equation is homogeneous in these lengths, so we can immediately convert to a trigonometric identity. We label the vertices and angles as in the red circle. Notice that because they subtend the same arc. So the 4 unlabeled angles in the corners are equal to the labeled ones in some order. Turning this around, Ptolemy’s theorem can be proven by proving this trig identity, and to prove it, one only needs a few basic trig identities and the fact that . Try it and see for yourself! Now, check out problem #15 from the 2013 AIME II. This entry was posted in Contest Math, math and tagged law of cosines, Ptolemy's theorem, similarity, sine, triangles, trigonometry. Bookmark the permalink.